ROGHA is a group of artists and creators all based in South Armagh, Ireland. ROGHA is a community of Handcrafters and Artists from South Armagh inspired by the beauty and unique heritage, majesty and myth of the Ring of Gullion delivering local hand made Irish Art and Craft. We chose the name ROGHA not just because it is the perfect acronym for the group but it is also the Irish word for ‘choice’. At ROGHA you will be spoilt for choice whether choosing the perfect unique wedding gift or souvenir of your stay in Ireland. We take pride in the highly professional quality of our products and the skill of our artists and makers. Individual bespoke commissions are always welcome if you have something special and particular in mind. Gift vouchers are available on request. 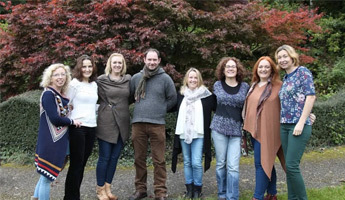 ROGHA is a working collective of artists and makers founded in January 2014 based in the Ring of Gullion, South Armagh. ROGHA decided to join forces to harness the creative flare, energy and creativity so abundant in this rich and rare land. Inspired and nurtured by the unique and mystical culture, and beautiful surroundings we came together as a collective to develop and promote our work locally and further afield and to harness our creative processes. Currently there are eight members working in the mediums of fine art, mixed media, wood turning, glass making, millinery, textile art, wearable art, and ceramics. Working together as artists and makers we aim to translate the beauty and richness of our shared culture through inspired artistic creations and highly skilled traditional crafts. We want the Ring Of Gullion to be as famous for the richness and diversity of its artisans as it is for its unique history, geology and biodiversity; not just an Area of Outstanding Natural Beauty but equally an Area of Oustanding Inherent and Natural Creativity! Come to a place you will not forget and take home a piece of art that will keep your memories of your stay alive forever. ROGHA artists and makers love working in the community; providing individual tuition or group workshops and demonstrations throughout the year. We also have a bus tour of our studios in South Armagh each August in during NI Craft month, details can be found on our Facebook page or by contacting us through the website. We would also welcome your support at our exhibitions where you will get the chance to meet the makers and learn about our individual inspiration and techniques. Keep an eye out on the Ring of Gullion Events page for up and coming exhibition. ROGHA is a group of artists and makers all based in South Armagh, Ireland.